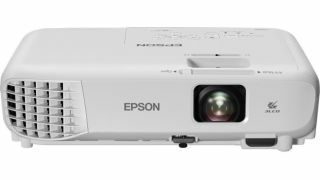 Black Friday deal: Grab an Epson projector for just £250 today | What Hi-Fi? Ultra HD 4K TVs may be particularly tempting during the Black Friday deals period, but no telly can beat the display-size-per-pound value of a budget projector. Today – and today only – Amazon is discounting the Epson EB-W05 LCD projector to just £250 as one of its ‘Deals of the Day’ - a 31% saving over its original £360 price tag. We haven’t tested this particular model, but in our experience Epson projectors are reliably impressive - and the EB-W05’s spec sheet gives every sense that this model is no exception. Its above-par 3,300-lumen brightness makes it suitable for well-lit light rooms as well as darker environments, while its claimed 6000-hour lamp life (or 10,000 hours on ‘Eco’ mode) means it’ll last for years. As expected, you don’t get features of pricier projectors, such as a Full HD or 4K resolution and motorised controls, but its 1280 x 800 resolution shouldn’t have trouble with playback of DVDs and Blu-rays, and manual lens adjustment and keystone correction offers flexibility when it comes to measuring the picture to your screen or wall. Furthermore, an optional ELPAP10 wi-fi adapter allows users to share content from a smartphone via the iProjection app.